My friend Harry Nicholson asked me to review his new novel, The Black Caravel. I helped proofread his last one, Tom Fleck, but I’ve had no hand in this book. So, first impression: I loved it! It’s quite a short novel but packed with incident and likeable and interesting characters. The Black Caravel is a sequel to Tom Fleck. 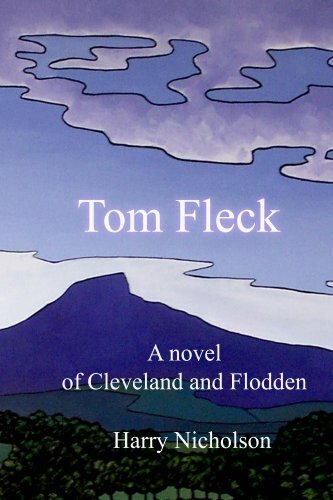 The latter is fully titled Tom Fleck: A novel of Cleveland and Flodden, and is set in 1513. The novel tells the story of 18-year old Tom and his adventures, which climax at the Battle of Flodden. You can read more about it here; as well as the first chapter. I highly recommend it. 1536 is a year of rebellion against Henry VIII’s seizure of England’s abbeys. Barbary corsairs raid northwards. Despite the turmoil, Tom Fleck must journey to London. You don’t need to have read the first book to make sense of the second – Harry reminds us of pertinent details quite seamlessly – but, as I might have mentioned, I recommend that you do, just for the joy of reading good historical fiction. I confess to loving Tom Fleck. He is brave, principled and adventurous. He’s what is popularly described as a book boyfriend: the man I would marry (after Jamie Fraser) if I could somehow dispose of the Hub without going to jail, assuming of course that I could bring a fictional character to life and he wouldn’t object to my complete lack of skills that would fit me to live in the 16th century (me being no Claire Beauchamp Randall Fraser). What I love about Harry’s books, however, handsome hero aside, are the fascinating details he weaves into his stories. I now know how to prepare a rabbit for the pot, making sure to steep it in brine overnight; and that gulls dine on dead men’s eyes first (despite that nugget, let me assure you that the books are not gruesome, although they don’t shy away from the unpleasant realities of their setting). I discovered from reading the books that Harry has a real love of nature which is not something that appeals to me, and yet it was engrossing to learn for example of the herbs that freshen your mouth or which heal in some way. Harry has a background in seafaring and his knowledge litters the pages of The Black Caravel without showing off in any way. He writes what he knows, and the books are better for it. Tom watched them depart and wondered at the brave poverty. It was a topsy-turvy world. Such a struggle to live. Hard knocks and cold drownings, and all the while velvet-clad folk in London’s great halls dined on swan. Dining on swan aside, I couldn’t help thinking of the modern world with its food banks; it’s rich/poor divide; its drowning, desperate refugees. A struggle to live indeed. 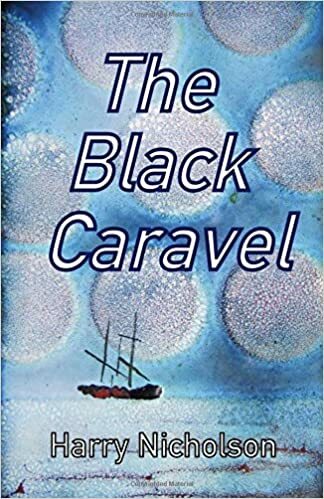 The Black Caravel: Amazon UK, Amazon US In the UK, this book is currently available free with Kindle Unlimited, so why not buy the first one at its very reasonable price of £2.24? Incidentally, Harry is a gifted enamellist (I think they’re called). Check his blog for some wonderful work; including the two originals which are his books’ covers. Muphry’s law is an adage that states: “If you write anything criticizing editing or proofreading, there will be a fault of some kind in what you have written.” The name is a deliberate misspelling of Murphy’s law. Just so you know, although it wasn’t a criticism, when I wrote, I helped proofread his last one, Tom Fleck, I actually wrote: I helped proofread his last one., Tom Fleck. There’s a reason Muphry has his own Law. It’s been quite a week. We spent all of Saturday afternoon at The Tree of War rehearsal, filming and photographing background stuff. Monday evening we were at the press preview; the show opened on Tuesday. It is phenomenal. I can’t tell you how good this new piece of theatre is: the music, the lyrics, the story. And to see it acted and sung with such passion and enthusiasm; to hear the wonderful music from the live band; to come out crying after every single performance…there is no one involved in this production who doesn’t believe that it is something special, something above the ordinary. One of the most consistent comments – though you heard it here first, last year – is that it belongs on a West End stage. As I stand behind my camera each night and listen to the audience as they file out, many sobbing into their snotty tissues – men and women – I hear them saying it over and over. People with no connection to the show rave about it; and they are right to do so. Ollie Mills’ and Rachel Mann’s masterpiece is beautifully poignant, thought-provoking and utterly authentic. I thought Alex really brought out the personal, but also universal, pain and intensity of the WWI horrors. As the show progressed, he displayed real pathos – having been excellent too in the earlier, happier, scenes. I thought both he and Sam made very strong leads. 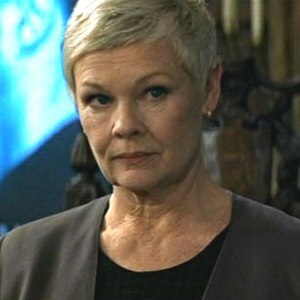 But then I felt the whole cast was strikingly good – having, I judge, been brilliantly prepared by [Ollie]. Went to see one of the most amazing things I’ve ever seen today! Well done to all the Cast and Crew of The Tree of War you were AMAZING! You completely reduced me to tears. Amazing piece of theatre! Really powerful. Just got back from watching The Tree of War what a fantastic play each and every cast member played a brilliant part, it should go on TV or all around the country, well done to all of you, it was just brilliant. It was, quite simply, one of the most powerful pieces of theatre I’ve seen. Oliver Mills’ score is brilliant and if he and Rachel Mann don’t make a cd I shall be really disappointed. The cast were all fantastic. Sam Gilliatt and Alex Cosgriff in particular. Remember Alex’s name. He’ll be winning Olivier awards one day. I don’t know if they have any tickets left, but if they do and you’re free, go! Ollie Mills’ music was quite amazing. If you live in the area, today is your last chance to see it. There are a few tickets left for the matinée and evening and they are on special offer at £5 each on the door. But booking online will guarantee you a seat. Trust me: go if you can. If you don’t, you will always regret missing the start of something big. On Saturday afternoon, I saw the second-ever performance of The Tree of War. I mention this because – well, have you ever been in at the start of something big, and known it was the start of something big? That’s where I was at on Saturday afternoon. 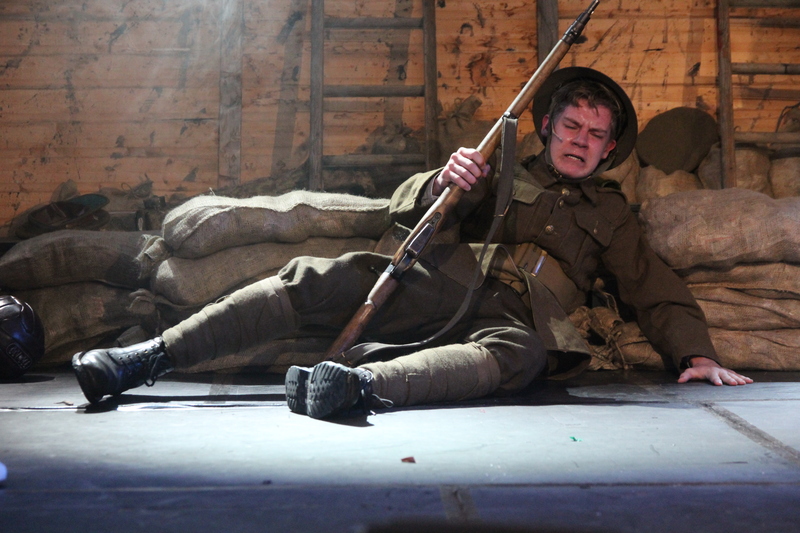 The Tree of War is a musical about life in the trenches in WWI. Written, scored and directed by a poet priest and a twenty-year-old music student, it was a community theatre project at St Nicholas’ Church in Burnage, funded by Manchester City Council. A précis: Grandpa Bert tells his granddaughter the story of his time in the trenches. That’s it; that’s the whole story. And what a marvellous, rousing, moving story it was. I had better declare an interest here: my son, Alex Cosgriff, played Young Bert – ladies’ man; loyal son; good friend; cannon fodder. He played him well: his singing was wonderful; he really can act; I burst with pride. But he wasn’t the whole play – a strong community choir and a good amateur cast was headed by Mike Law as Grandpa Bert: he was warm and cosy, sad and regretful. Sam Gilliatt as Bert’s friend Greville has a voice with the sweetest tone, and his duet with Alex was a thing of beauty. Jamie Rahman played Dougie McBride as a dour Scot; with a gorgeous voice, his solo sent shivers down many a spine. The exploration of life in the trenches was well conceived – boredom, fear, letters to and from home; and the drinking…ah! the drinking! The best number among a raft of great numbers was The Lads’ Drinking Song: bawdy, irreverent, rousing and huge fun. The staging was excellent. The tree of the title was out in the foyer, and that’s where the action began. 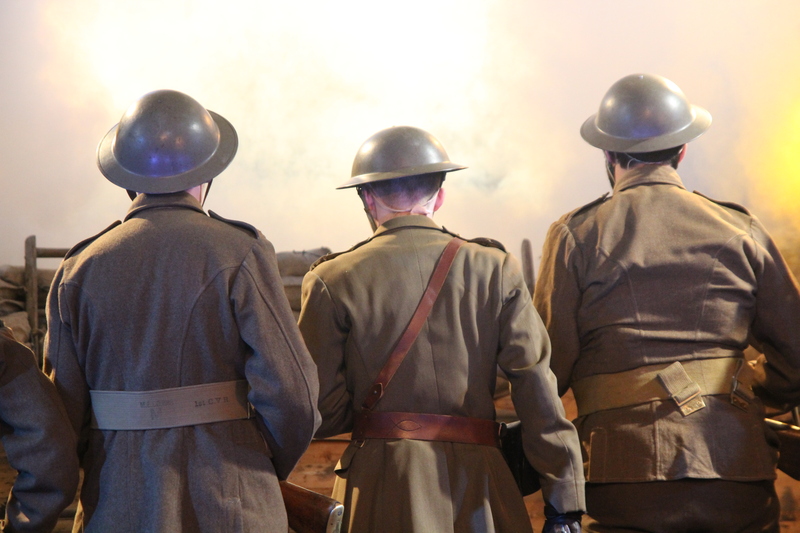 The audience stood to watch until directed to move into the trench area, which was set almost completely in the round. We were in the trenches with the lads and shared their laughter and tears; their hopes and fears. We could see their sweat and almost smell their breath. If I have a criticism of The Tree of War, it is that it needs another twenty minutes and at least one more song – possibly a ballad for Young Bert – because it will have trouble getting to the West End otherwise. And believe me, this is a play that deserves a wide audience. If Oliver and Rachel don’t take it to Edinburgh next year, they’re mad. They could take it at this length and then extend it when it gets picked up. Look out for Oliver Mills because he is a massive talent. To write such music and direct with such flair at his age…words fail me. I want to be able to say I reviewed Rachel Mann’s and Oliver Mills’ premiere production of The Tree of War before it was a massive worldwide hit. Sidey’s Weekend Theme is Sunshine. Here in Stockport we don’t get much sunshine, being the English equivalent of Twilight‘s town of Forks, minus the pretty vampires. So, just rain, then. 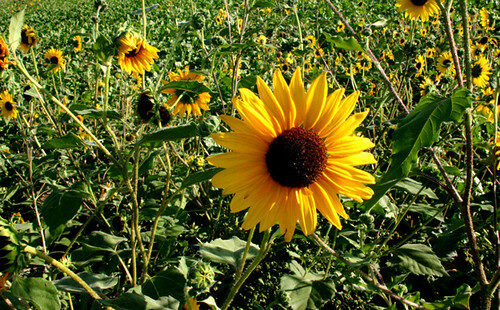 Have a great weekend, flowers! I once acted out of character and it paid off. Let me explain: I am quite shy. No, really. I’m rubbish at cold calling; at asking strangers for something. I once had a job as a Carpet Cleaning Saleswoman (it was the early Eighties; I wasn’t a person then). I had to go door-to-door to tell people that they needed me because their carpets were dirty. All for an alleged weekly wage of £75. 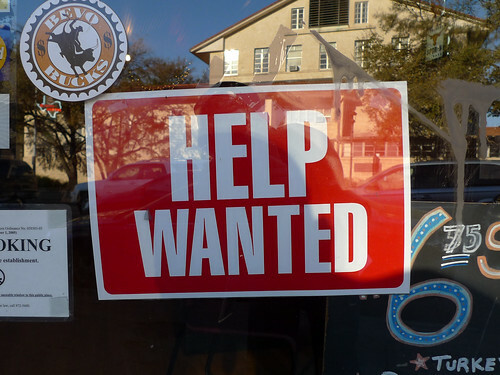 I was so bad at cold calling and made so few sales (ten-day total sales: zero), they put me on commission at the end of the first week (it was the early Eighties; I had no rights that I knew of, being eighteen and stupid). In one month I earned a grand total of £9. If they had only asked me to write to the customers, it might have been a different story. As this one is turning out to be, because it’s about my writing group. No, really. I saw an article in our local paper about a local writer who had just published her third book – actually, it was her second book, although she has written her third book; the reporter got it wrong – may his rugs remain forever filthy – despite the author sending him the details in cold hard ether. Fortunately, I didn’t know that at the time, or this might have been a different story (not really, but repetition is a good comedy device and I’m feeling facetious today, even a little lightheaded, not having blogged at you for five days). I read in the Stockport Express that author Allie Cresswell had not only published her third book [not], but she lived in Stockport and had a website. I moseyed on over to her website by way of dinner, dessert, crisps and a bar of chocolate, and thought she looked friendly enough, so I girded up my now ample loins and popped off an email. That’s the bit that was out of character – I cold called an author. Yo! I said, I belong to Stockport Writers. We have no money; will you come and talk to us for free? Yes, she replied; I’d love to. I’m pretty sure my charm and erudition won her over. All joking aside, it was a great day. Warm and friendly, Allie told us a bit about herself (passing off the sloppy journalist’s carelessness as just one of those things…so magnanimous*), her writing background and her career. Then she read from one of her books – we enjoyed it so much, we asked for more. After a break for tea and cake (these loins won’t amplify themselves, you know), Allie set us a writing exercise, which had everyone interested and animated. To keep things fresh, we do rotate the chair each month, as in, a different person chairs each month’s meeting; we don’t sit in swivel chairs and circulate stationarily (the gallery staff keep those chairs to themselves; we can’t complain because they let us use the space for free). To have someone entirely new set the prompt made us all a little giddy, and produced some wonderful freewriting. *If I appear to be losing it a little here, it’s because I am. Remember my magnum opus (I Went To London To Be On Telly And Get Free Stuff)? It might have turned out all right in the end, but that sloppy – and somewhat vindictive – journalism has made me over-sensitive. Besides, that Stockport Express journalist didn’t publicise our guest speaker like I asked him to in my second – and last – out of character cold calling email. May his rugs remain forever filthy. Allie brought some of her books and I felt, having strong-armed her into coming along, that I ought to buy at least one of the novels, but I didn’t have enough money on me. Fortunately, she sells them for Kindle, and I was able to buy two for less than the price of one hard copy. Even more of a bargain, the Amazon account is hooked up to the Hub’s credit card and not mine so, technically, I got them for nothing. And I had cake! What a great day. Our guest also got a booking, from one of our writers who attends another group, so it was a win-win situation. Now I come to the reason why I haven’t blogged for five days: I started one of the books, Relative Strangers. As a pretty woman might say, big mistake; huge. You should see the state of my house – I’ve done no housework because all I wanted to do was read; and the dogs aren’t talking to me. The book explores the dynamics of family life by gathering together one extended family in a large house for one week. At first, I was confused by the sheer number of characters but I soon worked out who was married to whom and had which children and which in-laws and which rooms and cars and grievances and grudges. The book is packed with incident and was a really interesting and fun read, but not fun in the way – I hope – this post is fun. It was a fascinating exploration of relationships: the characters, for the most part, were neither good nor bad, but human, with foibles and faults like we all have. The ending surprised me. And that’s all I’ll say, because I don’t want to give anything away. If you like surprises, don’t read the blurb on the website because it tells you in which direction the ending heads. There were more typos than I usually approve of but I let them pass because I enjoyed the book so much. I only mention them because I want this to be a balanced critique. Definitely recommended. You can trust me; it’s not like I’m a journalist (sorry, Kateshreswdaytheexception). You can find Allie’s website here; and her books on Amazon here; and here. They are available on Amazon.com as well as the UK site. I hope you’ve enjoyed this post because you may not get another for at least the next five days: I have her other book to read. When you were 16, what did you think your life would look like? Like I was a successful actress. Does it look like that? It is what it is. I never had the courage to pursue it so I have nobody to blame but myself. Regrets are useless so I don’t have any. What I do have is a happy marriage and two gorgeous sons. I wouldn’t trade them for anything. Cooking, so I could hang on to this perfect family I am slowly poisoning. Well, dear WordPress prompter, I’d rather not say because I don’t really know you. Tilly’s death at the hands of irritated WordPress prompters was sudden but inevitable. She never knew when to quit and they didn’t like her pointing out that she had recently had to write her own obituary and was it personal on their part or had they become FreudPress prompters? Also, she knew her way around a box of Maltesers, but not a kitchen. The internet. How else would I have discovered a bunch of people around the world willing to send me stuff out of the blue? Speaking of which, thank you for the book, Bee Blue. I’d kiss you but I know how you feel about that. Go to the nearest window. Look out for a full minute. Write about what you saw. That’s it. It’s bigger than our house and blocks the view to everything…no, wait: something’s behind it. Is that a WordPress prompter with a stick of dynamite in her mask…? Describe your relationship with your phone. 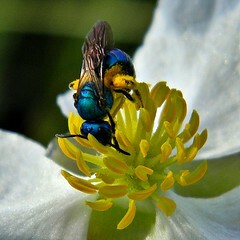 Is it your lifeline, a buzzing nuisance, or something in between? I’m sure that once I discover how to turn it on, we’ll be the best of friends. It’s like Robin Williams. Since Aladdin, they all are. Why do I need to learn a new skill? I have my own personal genie. I was reading this post when I heard the car door slam, and immediately looked at the clock. I knew it was the Grammar Police, come to take away the WordPress prompter who had one too few ‘t’s in his at.